In February: get a free gift just for viewing a unit! Come in today. Our mission in life is to help you stop feeling out of control, stressed and living a cluttered life. Instead, enjoy that peace of mind, relief and sense of calm that comes with knowing where everything is and that it’s secure and nearby. Best of all - you will have one less worry checked off that nagging to-do list thanks to Aladdin Self Storage. Kill Chaos With Louisville’s Only 15-Point Storage Value Plan! It all adds up to the Louisville’s best quality, service and value in self-storage. Our Free Moving and Storage Guide for You! 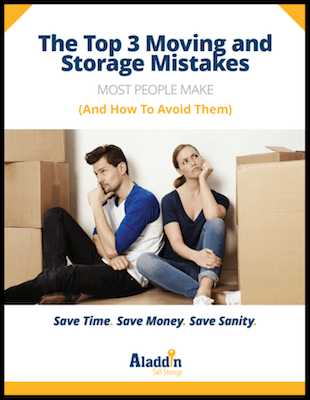 Download this free guide to make your moving and storage day hassle and worry free! Since moving and storage isn’t an everyday occurrence, a lot of small - but important - details fall through the cracks. And that can cost you time and money. This guide provides a free checklist to make sure you pick the right size and right type of unit, select the right size transportation for your move, have all the right supplies and select the right timing to make the most out of your move. It can be tricky to know exactly how much space you’ll need. Start with our free size calculator that visually shows you how much you can store in different sized units. This quick no obligation call helps us confirm the right size and type (drive up, temperature control, hallway) unit at the best value for you. Don’t over-rent or be without enough space on moving day. Call us at (502) 241-7200. Come in at a day and time that works best for you! Start your lease, pick up your lock and enjoy our surprise gift just for you (Our customers love it). We'll make your experience hassle free! Rent your unit online. Give your mind a rest and let us take over from there! Enjoy that peace of mind, relief and sense of calm that comes with knowing where everything is and that it’s secure and nearby.